Several books have been written about the 1879 Meeker incident and the dispossession of the northwest Colorado Utes, but journalist Robert Silbernagel became a historian on horseback to learn more details about those tragic events. He provides fresh insights in a fast-paced, well-written book that is the first new analysis of Ute removal published by a university press in decades. Troubled Trails: The Meeker Affair and the Expulsion of Utes from Colorado will become a benchmark book in Colorado history. It is a major contribution to Native American and Western history written by a sensitive man who maintains a professional journalistic balance in his assessment of court documents, newspaper accounts, Congressional testimony and valuable Indian oral histories. Silbernagel traced the route Ute warriors and families took when they fled Powell Park and the White River Valley. He rode many miles on their route on horseback and also covered their trails in a small airplane. The book masterfully blends on-the-ground research with hours spent in archives. Readers will learn about the family dynamics of the Meekers, including important details about Nathans wife, Arvilla;, the daughters, Josie and Rozene; and son Ralph. Silbernagel presents a full, fresh portrait of Nicaagat or Captain Jack blown to bits by the small cannon aimed specifically at him  an ignominious end for someone who deserves to be among the pantheon of American Indian leaders. Silbernagels contributions include an important understanding of the history of taking hostages among tribes in the Southwest. The Utes used the three women and two children as a successful buffer against an outraged U.S. Army still smarting the death of Gen. George Armstrong Custer three years earlier. The manuscript deftly alternates between chapters describing the difficulties of the hostages with the larger historical context and political machinations at the state and federal level that will culminate in Ute removal. The author provides fascinating new facts about She-towitch or Susan, Chief Ourays sister, who intervened on behalf of the hostages. For her efforts, Chicagoans signed a petition to Congress for her to receive 640 acres of land, though nothing came of it because Coloradans insisted that Utes leave the state. Silbernagel analyzed the movements of the Ute bands, the 3,000 horses of the White River Utes, the hard miles ridden by Ute scouts, white scouts, hostage negotiator Charles Adams and assorted players in this real drama of misunderstandings, anger, death and loss of land. One of the best chapters is about Ute-horse culture, and the importance of horses in transforming mountain Utes into a powerful tribe that dominated both their shining mountains as well as bison-hunting territory on the eastern plains of Colorado. Silbernagels attention to scholarly detail and the western Colorado landscape could result in formal interpretive signage at Rio Blanco Hill, Rifle Creek, the Colorado River and Plateau Creek, places where the hostages camped. Local historical societies, or perhaps the Colorado Historical Society, should mark these forgotten Ute trails, which are becoming obscure because of oil and gas development. Another important outcome of Silbernagels research should be a movement for the Milk Creek Battle Site to become a National Historic Site owned and interpreted by the National Park Service. Troubled Trails is a fine book and deserving of a wide audience. Silbernagel captures all the tension, trauma and travails of the Utes and their hostages. He rode their trails on horseback and also tracked them down through government records and personal contacts with Ute elders. His scholarship provides new perspectives for readers interested in the 19th-century American West and the Indian Problem as it played out in western Colorado. 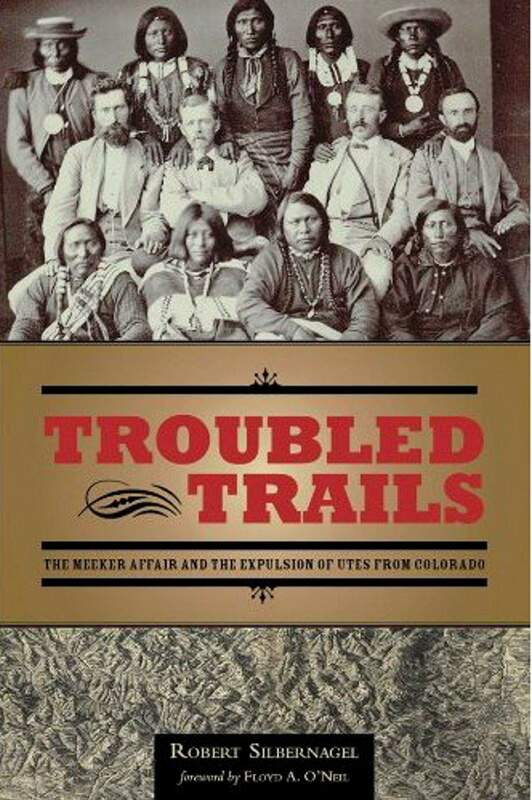 Troubled Trails: The Meeker Affair and the Expulsion of Utes from Colorado by Robert Silbernagel, University of Utah Press, 304 pages, 24 photographs, 6 maps, paperback, $24.95. Silbernagel will speak at the next meeting of the San Juan Basin Archaeological Society at 7 p.m. Thursday in the Center of Southwest Studies Lyceum at Fort Lewis College.